One hot night in the City of a Thousand Vices, the fates of three strangers become intertwined, as two chases, a kidnapping, and a hunt for fabled treasure fuse and transform into a mission to save...everyone. For as wicked as the denizens of Tozer may be, they pale in comparison to the sorcerer Oto Xar and the disciples of Gish. Come, weave a tale of blood-spattered heroes who pit rippling muscles and keen blades against otherworldly vengeance an eon in the making! SAVAGE SWORDS AGAINST THE NECROMANCER is a reverent homage, meant to recreate the wonder and excitement of the weird tales that became popular in the pulp magazines of the 1930s. These stories of brawny warriors, black magic, and terrible monsters established the genre that later was dubbed Sword and Sorcery. Definitive examples of this literary style are the tales of Conan the Barbarian by Robert E. Howard. Considering the zeitgeist and Howard’s relationship with H. P. Lovecraft, it is not surprising that elements of Cosmic Horror sometimes appear in Sword and Sorcery fiction, and likewise in this adventure. 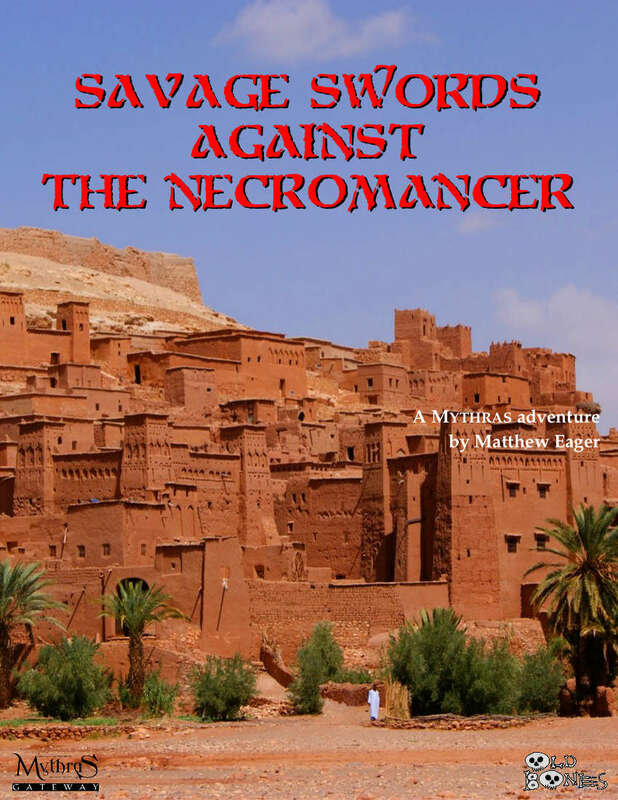 SAVAGE SWORDS AGAINST THE NECROMANCER has been designed as a one-shot adventure full of danger and mayhem, for a long weekend or perhaps tournament play, but also should be easy to integrate into an existing campaign. It is intended for three or four player characters; three sample adventurers are included, for an instant start. Mechanical details have been constructed using the MYTHRAS game system from The Design Mechanism, and the write-up should translate well to other d100-style rules. This adventure should be suitable for players of any experience level, including those trying MYTHRAS for the first time. Still not sure about this one? Download the FREE TASTER for a bit more--but beware of spoilers! OLD BONES PUBLISHING strives to provide high-quality writing in a stylish, minimalistic presentation. Thanks for your interest! Please direct any question or feedback to old.bones.publishing@gmail.com.